A few years ago, I was sitting in my office and listening to NHPR’s The Exchange belting into the air from the kitchen radio. I heard the term “Pollen Vortex” and I was instantly a captivated listener. I’m not a sufferer of major allergies, but once in a while I find myself with a scratchy throat and a runny nose. 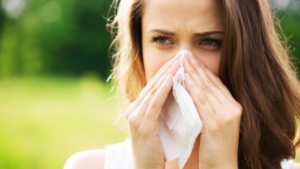 I thought I would share their program with my readers because I know that there are a lot of people out there who are probably bracing themselves for a really tough allergy season. What I found interesting about the program was the discussion of how climate change as well as major changes to the environment (burning of fossil fuel) are most likely behind the allergy issues so many of us face. As described in the NHPR piece, a late arrival of spring holds off the release of pollen because nothing is flowering. This disturbs the sequence in which many different trees flower. If the temperatures suddenly get warm very quickly and stay consistent this could cause all of the trees to flower together and release pollen all at once and there you go! Pollen Vortex! This story made me think about organic lawn care (of course!) and how our approach here at Complete Land Organics uses no “petrochemical” products. Like any petrochemical activity, generating nitrogen from natural gas is a dirty process. To make synthetic fertilizer, ammonia companies not only generate vast amounts of carbon dioxide, they also emit millions of pounds of toxic chemicals each year into our environments and ecosystems. See how all of this is connected? This is why it’s so important to do small things to help save our planet. Start with practicing organic lawn care instead of using pesticides and synthetic fertilizers, and you will be making a huge impact! Contact me to learn more about the value of organic lawn care strategies.